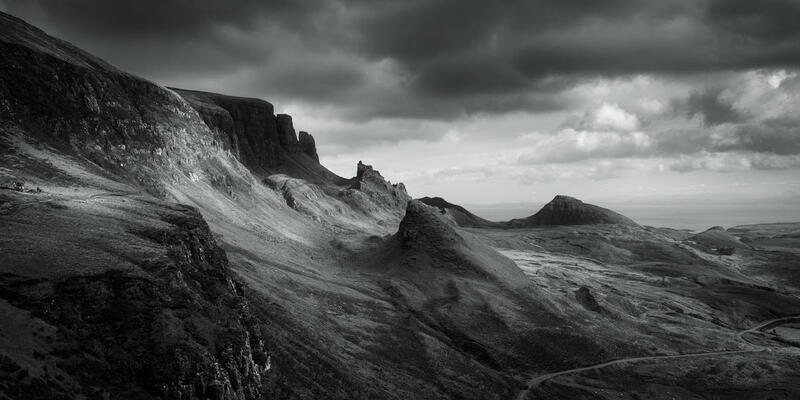 Scotland has so much to offer the landscape photographer. 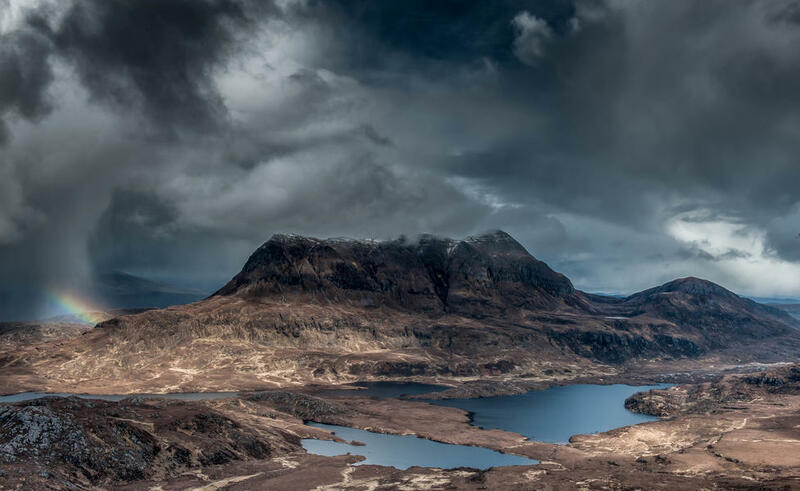 The northwest is mountainous and remote, with the western Isles offering views akin to New Zealand. Scotland has over 790 islands, most of which are located within the inner and Outer Hebrides, Orkney and Shetland. Many of these islands have an almost Caribbean feel with crystal clear turquoise water and stunning white sand beaches. 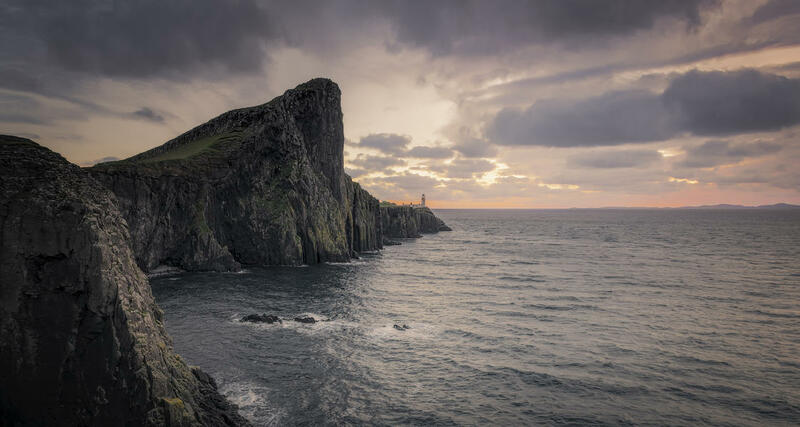 The mainland is fairly small so travelling from east to west or north to south can be done in a relatively short time and there are hundreds of miles of beautiful coastlines to be explored with many picturesque harbours and lighthouses dotted around. There really is something for everyone. Scotland is a country rich in history. There are several surviving castles serving as popular tourist attractions. 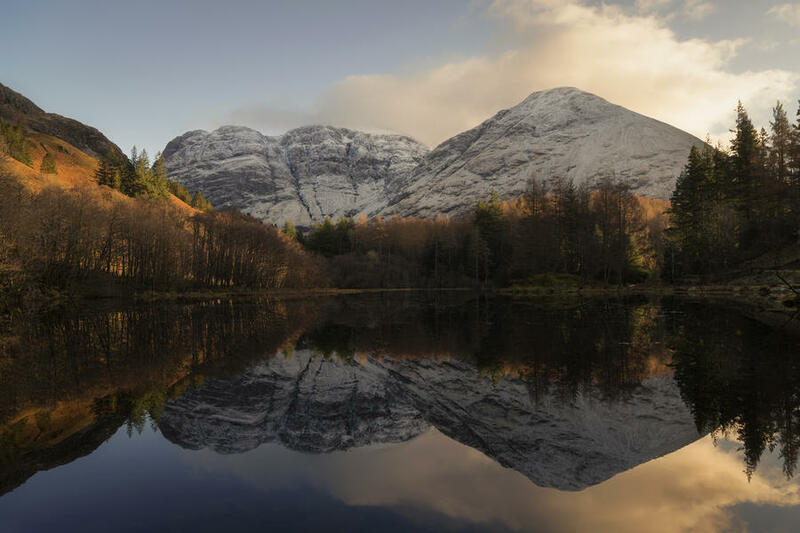 Scotland has many untouched national parks which offer stunning nature and wildlife opportunities. There is also a fantastic blend of ancient and modern architecture within the major cities. Glasgow, in particular, has an interesting blend of 19th-century Victorian buildings, Charles Rennie Mackintosh-inspired buildings and modern edifices. Both Glasgow and Edinburgh offer open top bus tours which offer hop on/hop off tickets to explore the areas in full. One of my favourite locations to visit in Scotland has to be the Trossachs National Park located within Stirlingshire. There are plenty of little lochs in this location and each has its own quirk that makes it unique. Loch Ard is a particular favourite of mine. This loch runs east to west and is protected on all sides by surrounding hills. This means it is perfect for capturing mirror-like reflections, particularly on the eastern side where the loch is not as wide. 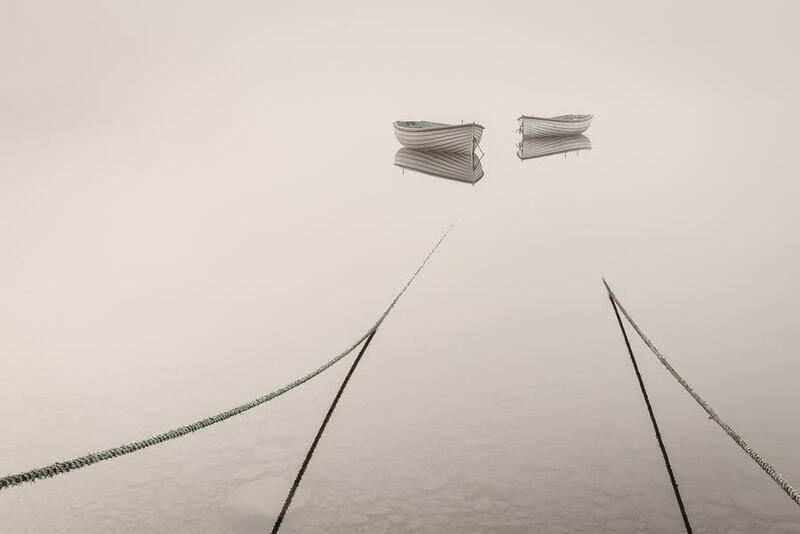 There are a few wooden jetties and boathouses which make for interesting subjects. A short drive west from here (15 minutes) Loch Arklet offers views to the Arrochar Alps. 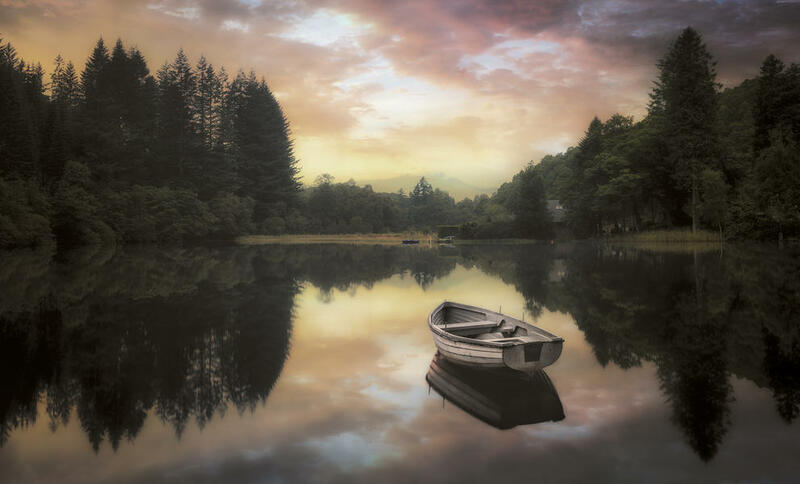 If you drive east from Loch Ard for 20 minutes you will arrive at Loch Rusky: a small loch which often holds onto morning mists longer than most others. Through the spring and summer months, there are several little rowing boats moored here which are used by local fisherman. Glencoe is another favourite of mine. Every corner you turn there is a stunning landscape waiting for the photographer. A mountainous region with deep valleys scored out by the fast-flowing rivers, this region has everything a photographer could want: grand vistas from hilltop viewpoints, large towering mountains with a plethora of foreground interest including winding rivers, waterfalls and even a memorial to a local hill climber who sadly passed prematurely. Climbing the hills and mountains offers stunning views down into and across the valleys. You are often above the weather and capturing a cloud inversion is not uncommon. 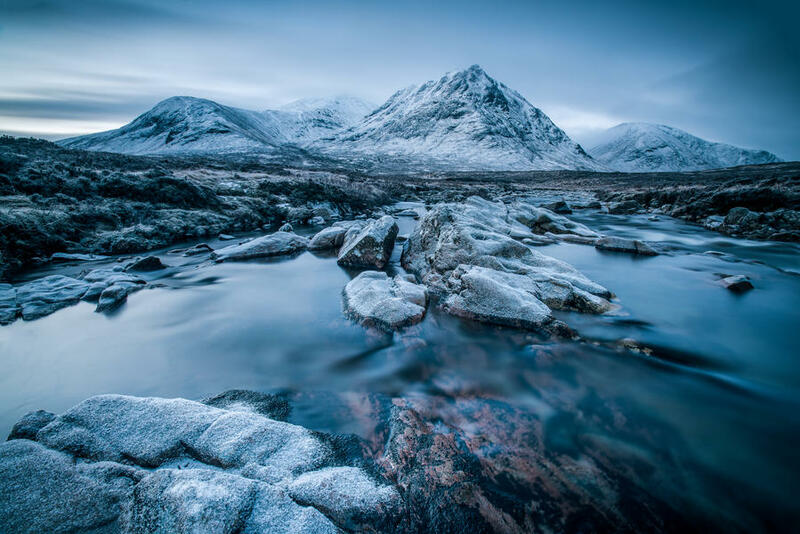 Many landscape photographers choose to wild camp when staying in the Glencoe region. This is often the best way to catch the glen at its best as you are at the summit of the hills for sunrise. 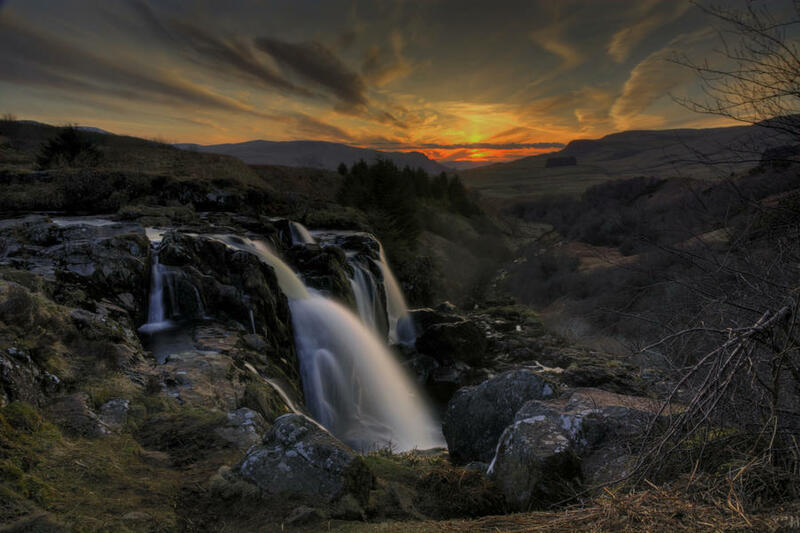 A lesser known spot to photograph in Scotland includes the Loup of Fintry. This is a waterfall on Endrick water measuring almost 100ft in height. There are many viewpoints from which to shoot this waterfall over its three defined stages. It suits all seasons as heavy rain or melting snow can increase the volume of water dramatically. Filters are required here as the falls face the setting sun and catch the last rays of the low sun. With caution, it is possible to scale the face of the falls and shoot from below which creates a much more dynamic, energy-filled image. 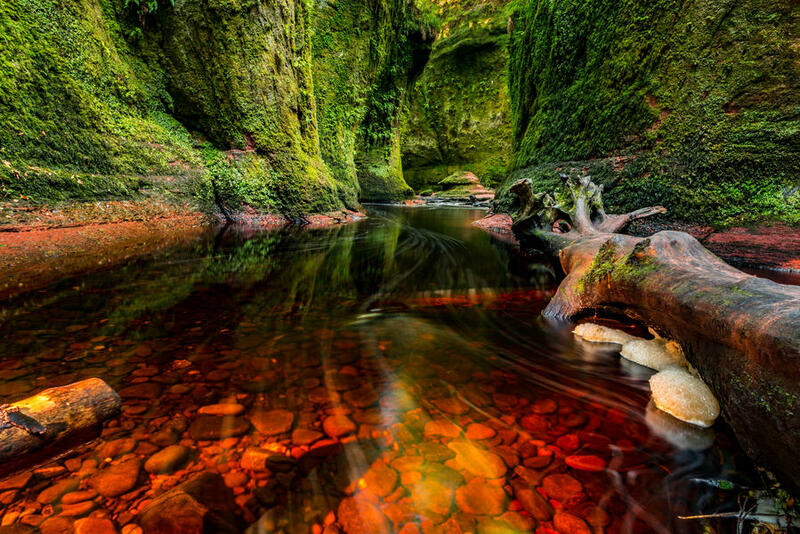 There is an area known as ‘The Devil’s Pulpit’ located within the Finnich Glen just north of Glasgow. This is a deep narrow gorge with green moss-covered walls and rich rusty-brown water, giving great colour contrast to any image created here. It can be challenging accessing the gorge but, if caught at the right time of day, the sun shines directly into the gorge lighting up the side walls beautifully. 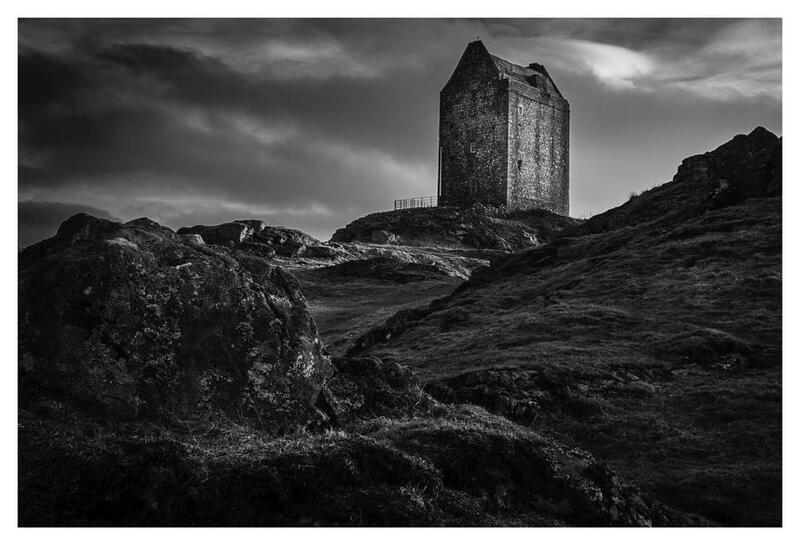 Smailholm Tower dates back to the 1400’s and used to be utilised for guarding the border between England and Scotland. The tower is surrounded by rocky crags, a pond and several elevated grassy viewpoints each offering different views of the picturesque tower. The tower is located 15 minutes west of the Kelso in the Scottish borders. 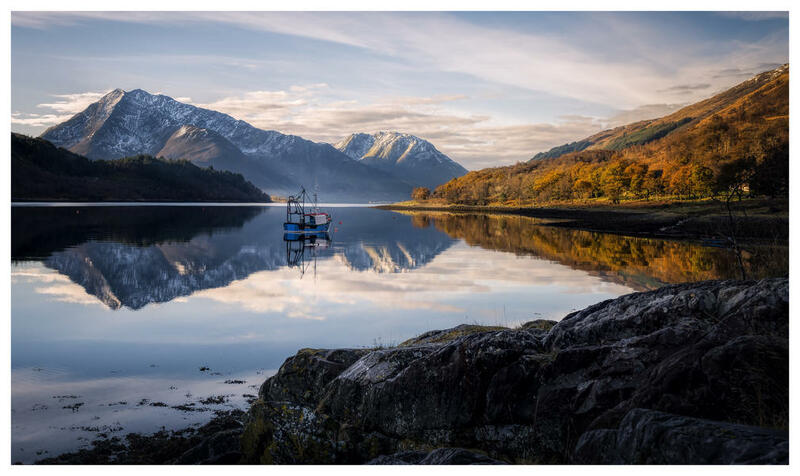 Each season in Scotland can offer something truly magical. My personal favourites, however, are winter and autumn. There is nothing more spectacular than capturing a sunrise of pastel pink skies atop a snow-capped mountain range. The air is so crisp and fresh, and the subtle contrasts between the soft white snow and the rich pastel pinks and blues at first light is unbeatable. Northern Scotland tends to see more snow than the rest of the country, although be sure to check weather advisories as parts of the elevated roads running through the highlands are closed off during heavy snow. Autumn in Scotland is when the Glens of Perthshire really come to life. The luscious foliage of Glen Lyon starts to turn from soft yellow to dazzling orange and fiery red. Viewed from a high vantage point the hillsides can look mesmerizing with an array of autumn colours. Rivers tend to be fuller and fast flowing. Scotland’s native plant, heather, is in full swing during early autumn and can create a beautiful carpet of all colours. 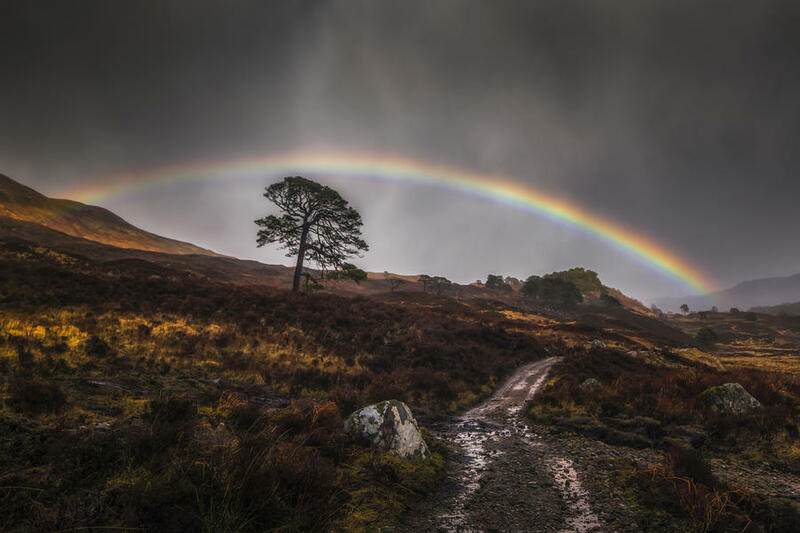 Scotland's weather can be extremely varied no matter what time of year you visit; it can be changeable and difficult to predict. One day in Scotland can expose the photographer to all four seasons of weather. 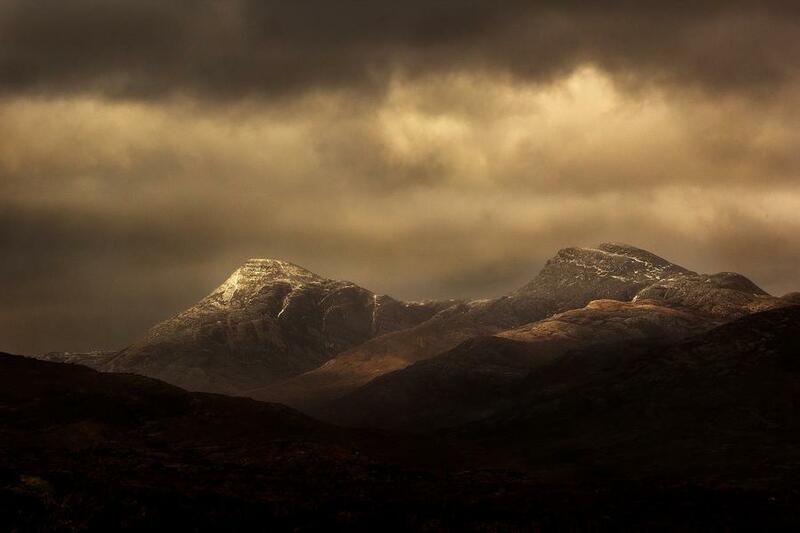 But this changeable weather is what makes photographing in Scotland special. Capturing the landscape either as a storm approaches or leaves produces wonderfully atmospheric light often with dark brooding clouds overhead and dappled sunlight dancing over the land. It receives a high amount of rainfall and generally the west coast sees more rain than the east. The Western Isles of Scotland are windy with little to no trees to help slow down the gales coming in from the North Atlantic. Two of the most well-known jokes about the weather in Scotland come from famous comedian Billy Connelly – ‘There is no such thing as bad weather, only the wrong clothes’ and ‘Scotland has only two seasons, June…. and winter’. The wildlife most often encountered in Scotland is deer. 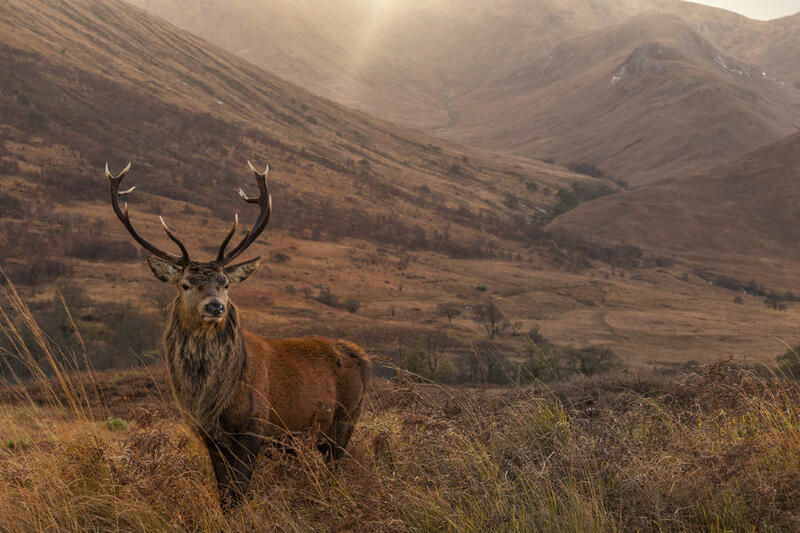 Two species of deer are native to Scotland: red deer and roe deer. Fallow and sika deer can also be spotted in the country. • Grouse (with the largest species being the capercaillie). • Many species of birds of prey including the Kestrel, Osprey and Golden Eagle. There are many organised wildlife tours offering bespoke workshops for capturing these wild birds at their best. The wideangle 21mm allows me to capture large foreground interest which leads into the wider scene. I use this lens because it is a manual focus lens and this helps to slow my thought process down whilst out in the field. It’s important to me to take time to ensure that composition is free from any distracting elements before I create the image. I then use the 24-70mm to capture architecture or larger vistas and the telephoto zoom lens in woodland to help compress perspective. It can get rather windy in places and not having a sturdy tripod would make it almost impossible to get sharp photographs. I currently use a Benro Mach3 tripod which is very versatile. It extends to just under 7ft and can be almost flat to the ground given there is no centre column. It is extremely tough yet light. If shooting seascapes, it’s important to always rinse out tripod legs in fresh water and apply a lubricant to all tripod joints. Performing this routinely will help combat erosion of your tripod from the saltwater. Many of my images are made in the first or last hours of the day when the light is low and the scenes are full of contrast. I couldn’t make many of my images if it wasn’t for my Progrey USA filters. I use both neutral density filters to allow for long exposure shots and graduated neutral density filters to control bright highlights from the sky. I use Progrey over any other brand because of the quality of filters they produce. There is no colour cast from any of their products and images remain sharp even when the filters are stacked. This means a correct exposure can be achieved in camera and I spend less time trying to remove unsightly casts in post-processing. As it rains quite frequently in Scotland, I tend to use all-weather backpacks. This helps to shield my gear from the often-torrential rainstorms that can sweep in. If I’m caught off guard and don’t have an all-weather pack I always carry a few black refuse sacks in my pack that I can quickly throw over my pack to keep it dry. I also always have several silicone pouches in my compartments to help combat moisture and mould creeping its way into my bag. I also clean all my lenses and filters after each outing with Iso Propyl Alcohol and a lens cloth. Any watermarks or debris on a filter can show up as flare if shooting into the sun or as distracting dust spots otherwise. I am fortunate enough to own a weather-sealed camera but I still don’t allow it to get absolutely soaked when out. If I have my camera and tripod set up waiting for the light and a rain shower starts, I simply slip a waterproof bag over camera and lens for the period of the shower. This means I don’t have to continually pack and repack and can keep my camera poised and ready should the light appear suddenly. Not only do you have to keep your equipment protected, you have to ensure that you are dressed appropriately for the conditions you may face when out in Scotland. The best way to prepare for the elements is to wear several layers – a base layer will help distribute moisture, one or two mid layers (usually of fleece material) will aid warmth and a final top layer will be both wind- and waterproof. In winter, it is recommended to pack warm headgear, scarf and gloves. This is also beneficial if you are hiking and climbing, and you should also think about investing in crampons and an ice axe to negotiate icy conditions. No matter the season, some emergency gear should always be in your pack such as a torch and whistle, food and water, and a compass and map. Windchill can change rapidly when hiking and an average drop of 1-degree Celsius for every 100metre ascent is the norm. 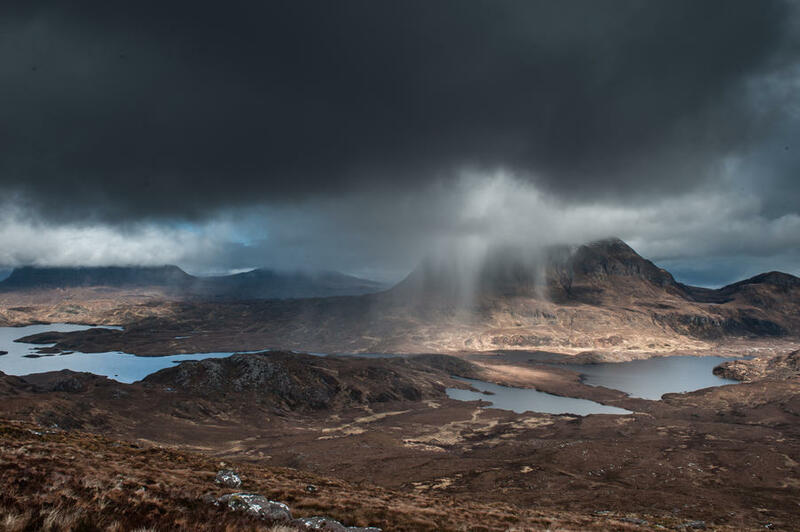 Many parts of Scotland can be quite boggy, so pack a good pair of walking boots, gaiters or wellington boots. When venturing into the unknown, I always ensure I have a fully charged mobile phone with me at all times. I also make sure someone knows my intended destination and that I will check in regularly. Many of the hill walks in Scotland are quite rocky over uneven terrain so can be a little tricky to navigate. 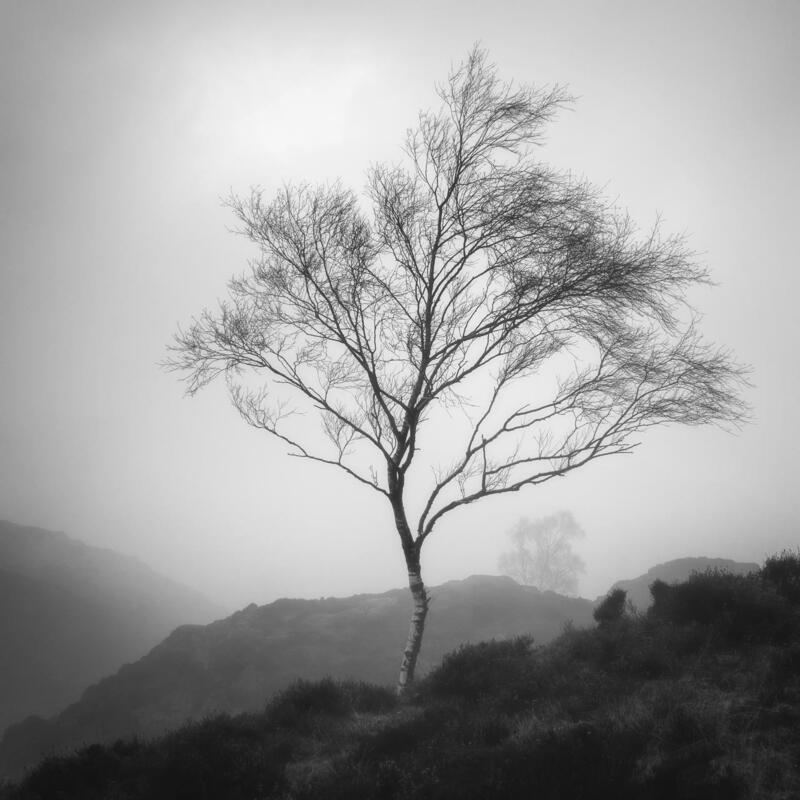 Visit Gavin Duncan's Photocrowd page to see more of his Scotland images. 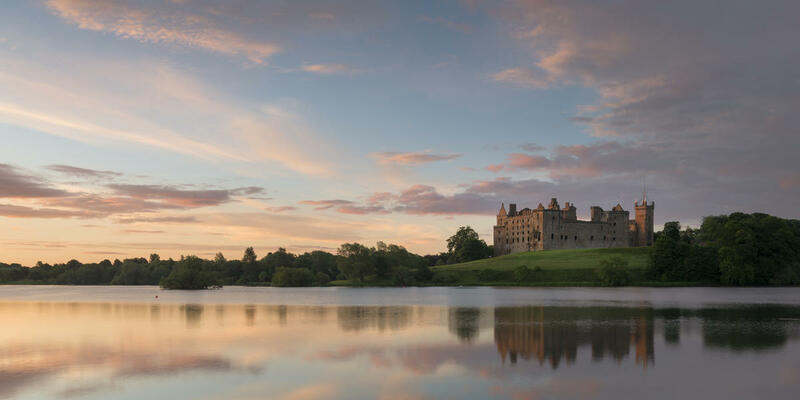 What are some of your favourite locations to visit and photograph in Scotland? Let us know in the comments below.